Philippine International School – Qatar was filled with excitement and en-thusiasm as they wit-nessed the opening of the annual departmental Friday Development Club last September 29, 2017. Energetic preschoolers with their parents graced the formality and ex-pressed huge support for the activity. The Friday Development club is an extra-curricular activity that brings out the artist in each student. It aims to develop and showcase the talents and skills of our children as they participate in a three month session which will end on December 22, 2017. The department offers two classes, Art and Dance class. The said classes are facilitated by our preschool teach-ers. 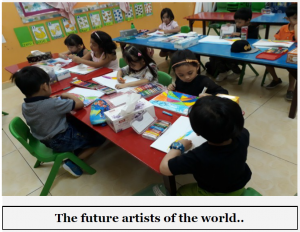 Ms. Rosalie C. Francisco and Ms. Lily M. Hervias for the Art Classes. The following sessions are being offered: Drawing, Pastel Coloring Activities, Water Coloring Activities, and Acrylic Painting. 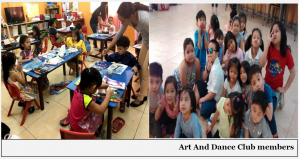 On the other hand, dance classes are facilitated by Ms. Mildred M. Morata and Ms. Maria Teresa D. Lacson. Variety of dances are being offered in their classes. These are the Jazz including Samba, Modern Cha cha, Zumba ,Contemporary Hip Hop and Folk Dance . Classes are expected to have their recital and exhibit on December 22, 2017.